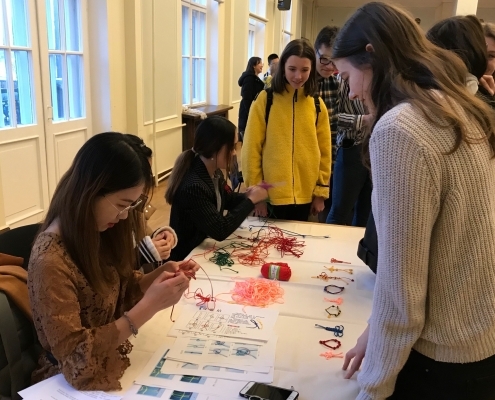 On January 31, 2019 New Year’s Reception was held in the Great Hall of Riga Technical University. 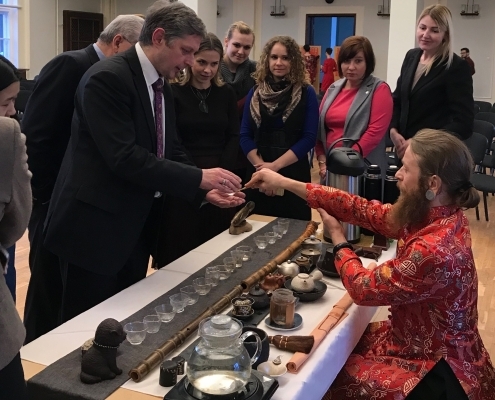 The administration, teaching staff and students of Riga Technical University and the guests from The Embassy of Peoples’ Republic of China in The Republic of Latvia, Latvian Ministry of Foreign Affairs, Confucius Institute of University of Latvia, Riga State Gymnasium No. 3 got together to celebrate the event. 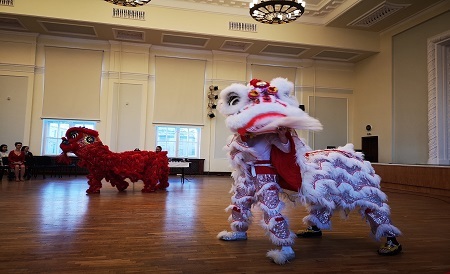 A gorgeous lion dance performance as an opening show quickly lighted site atmosphere. It was followed by the speech of Academician Leonīds Ribickis, Rector of Riga Technical University. Rector extended a warm welcome to the guests, teachers and students and expressed his wishes for the New Year. He pointed out that RTU and China had a good cooperation and hoped to have fruitful cooperation in 2019. Mr. Sun Yinglai, the Charge d’Affaires of Chinese Embassy in Latvia, delivered a New Year greeting and best wishes in his speech. He expressed his heartfelt thanks to RTU for the well-planned New Year’s celebration, and encouraged Chinese students at RTU to study hard and pursue their dreams. 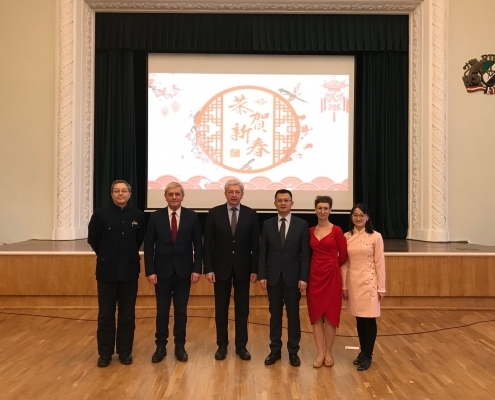 Professor Igors Tipāns, Deputy Rector of Riga Technical University summarized the cooperation achievements between RTU and Chinese partner universities in terms of scientific research projects, the number of Chinese students in RTU, and disciplines learned. He showed his confidence in the further cooperation. After greetings the audience watched the New Year blessing video prepared by RTU Chinese Class students and volunteer Chinese teacher Ms. Tang Yunxin. They expressed their New Year wishes in Chinese. 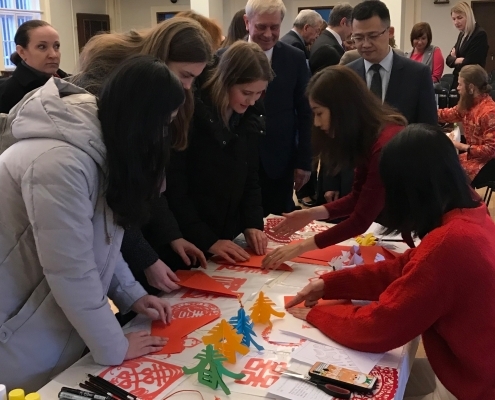 Then Chinese students presented the stories about Chinese Lunar New Year and Latvian Spring Holiday in Latvian. 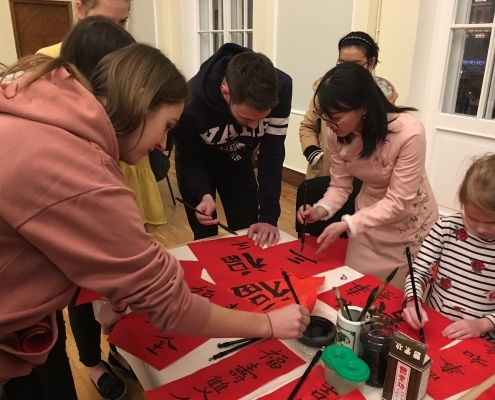 after that Chinese calligraphy, varied paper-cutting, auspicious Chinese knots, enjoyable tea ceremony, puzzles in Latvian and Chinese languages as well as tasty Chinese food were prepared for everyone. With the joyful and exciting atmosphere, everyone had a very pleasant time and stepped into the New Year together.